Kindermusik programs are easy to implement, with curricula designed to work in virtually any school-based, home-based, or childcare setting. 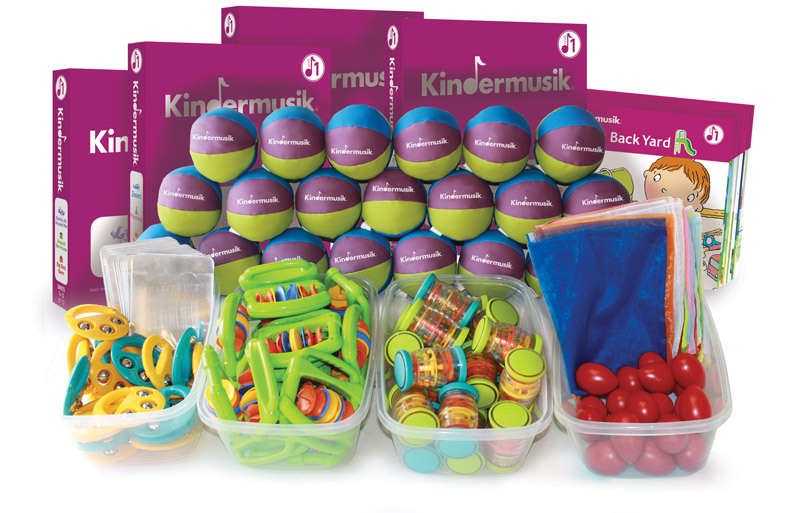 Kindermusik is a valuable addition to any preschool, pre-K, or early elementary curriculum. Our program uses music-and-movement activities to build listening skills, receptive and expressive language skills, and social-emotional skills such as turn-taking and self-control. It is based on decades of research and experience developing award-winning early childhood materials and curricula. Kindermusik aligns with many widely-accepted standards for high-quality early childhood education, including the Common Core State Standards as well as numerous state early-learning guidelines. Easy-to-follow teacher’s guides provide a lesson overview, highlight developmental benefits, and offer optional activity extensions. Our materials give teachers the freedom to observe, manage, assess, and enjoy interacting with the group and with individual children. Kindermusik Home supports family engagement by bringing the musical fun and learning into the home, recognizing the vital role of parents and caregivers in children’s overall academic success. The earlier children are exposed to a new language, the greater their chances for fluency. In fact, research indicates that children who start learning a second language before age seven are more successful language learners. Science has shown that listening to music and processing language activate similar areas of the brain, and researchers have discovered evidence that music enhances the auditory and cognitive abilities that play a role in second language acquisition. Kindermusik has been successfully implemented in leading international schools around the world. Our curricula is extremely versatile and aligns itself with global educational standards including the US Common Core, the UK EYFS and the IB, to name a few. Our program facilitates the learning both in native and emergent English speakers to develop early literacy but also take children on a sensory exploration. We also offer supplementary support and materials for U.S.- based classes with students learning English as a second language. Our EFL and ESL offerings are rooted in research on second language acquisition and utilize methods such as repetition and Total Physical Response (TPR), a language teaching system based on the coordination of language and physical movement. As part of a stand-alone program, or as an inclusion resource for children with special needs, our music-and-movement curricula provide a unique and effective way to reach children of all backgrounds, developmental levels, and learning styles. Kindermusik curricula align with IDEA funding. Our programs have been successfully implemented within special education curricula, and can be adapted to meet the needs of all children, including those with autism spectrum disorders, Down syndrome, developmental delays, and hearing or visual impairments. We offer a supplemental strategies guide for teachers that includes unit-by-unit activity modifications and an index of activities that can be used to target and develop particular skills for children with special needs.